Aftermath of the Babi-Yar massacre. At least 34,000 Jews died here in late September 1941. Babi Yar is a ravine on the outskirts of Kiev where Einsatzgruppen mobile squads killed at least 34,000 Jews over a one week period in September 1941. Russian estimates put the number of killed at nearly 100,000. Today, Babi Yar has come to symbolize the horrific murder of Jews by the Einsatzgruppen as well as the persistent failure of the world to acknowledge this Jewish tragedy. With the initiation of Operation Barbarossa, Germany's assault on the Soviet Union, the mobile killing units of the Einsatzgruppen operated over a wide area of Eastern Europe from the Baltic to the Black Sea. There were four main divisions of the Einsatzgruppen - Groups A, B, C and D. All under Heydrich's general command, these groups operated behind the advancing German troops to eliminate political criminals, Polish government officials, gypsies and Jews. Jews were rounded up in every village, transported to a wooded area, or a ravine, stripped, shot and buried. On September 19, 1941, the German army captured Kiev, Ukraine. Within a week, a number of buildings occupied by the German military were blown up by the Soviet secret police and in retaliation, the Germans proceeded to kill all the Jews of Kiev. Kikes of the city of Kiev and vicinity! On Monday, September 29, you are to appear by 7:00 A.M. with your possessions, money, documents, valuables and warm clothing at Dorogozhitshaya Street, next to the Jewish cemetery. Failure to appear is punishable by death. I watched what happened when the Jews – men, women and children – arrived. The Ukrainians led them past a number of different places where one after another they had to remove their luggage, then their coats, shoes, and overgarments and also underwear. They had to leave their valuables in a designated place. There was a special pile for each article of clothing. It all happened very quickly … I don't think it was even a minute from the time each Jew took off his coat before he was standing there completely naked…. Once undressed, the Jews were led into the ravine which was about 150 meters long and 30 meters wide and a good 15 meters deep…When they reached the bottom of the ravine they were seized by members of the Schultpolizei and made to lie down on top of Jews who had already been shot. That all happened very quickly. The corpses were literally in layers. A police marksman came along and shot each Jew in the neck with a submachine gun … I saw these marksman stand on layers of corpses and shoot one after the other … The marksman would walk across the bodies of the executed Jews to the next Jew who had meanwhile lain down and shoot him. Over the next week, 33,771 Jews were murdered at Babi Yar. Over the following months, Babi Yar remained in use as an execution site for gypsies and Soviet prisoners of war. Soviet accounts after the war speak of 100,000 dead and while research does not substantiate such a number the true figure will likely never be known. ... The Jews in their thousands, with such pathetic belongings as they could carry, were herded into barbed-wire areas at the top of the ravine, guarded by Ukrainian collaborators. There they were stripped of their clothes and beaten, then led in irregular squads down the side of the ravine. The first groups were forced to lie on the ground, face down, and were machine-gunned by the Germans who kept up a steady volley. The riddled bodies were covered with thin layers of earth and the next groups were ordered to lie over them, to be similarly dispatched. To carry out the murder of 34,000 human beings in the space of two days could not assure that all the victims had died. Hence there were a few who survived and, though badly wounded, managed to crawl from under the corpses and seek a hiding place. In August 1943, with the Red Army advancing, the Nazis dug up the bodies from the mass graves of Babi Yar and burned them in an attempt to remove the evidence of mass murder. Paul Blobel, the commander of Sonderkommando 4a, whose troops had slaughtered the Jews of Kiev, returned to Babi Yar. For more than a month, his men and workers conscripted from the ranks of concentration camp inmates dug up the bodies. Bulldozers were required to reopen the mounds. Massive bone-crushing machinery was brought to the scene. The bodies were piled on wooden logs, doused with gas, and ignited. When the work was done, the workers from the concentration camp were killed. Under cover of darkness on September 29, 1943, 25 of them escaped. Fifteen survived to tell what they had seen. Despite efforts to suppress the memory of Babi Yar, after the war the Soviet public at large learned of the murders through newspaper accounts, official reports and belles lettres. In 1947, I. Ehrenburg in his novel Burya ("The Storm") described dramatically the mass killing of the Jews of Kiev in Babi Yar. Preparations were made for a monument at Babi Yaras a memorial to the victims of Nazi genocide. The architect A.V. Vlasov had designed a memorial and the artist B. Ovchinnikov had produced the necessary sketches. But after the Soviet anti-Semitic campaign of 1948, an effort was made to eliminate all references to Babi Yar with the objective to remove from Jewish consciousness those historical elements that might sustain it. 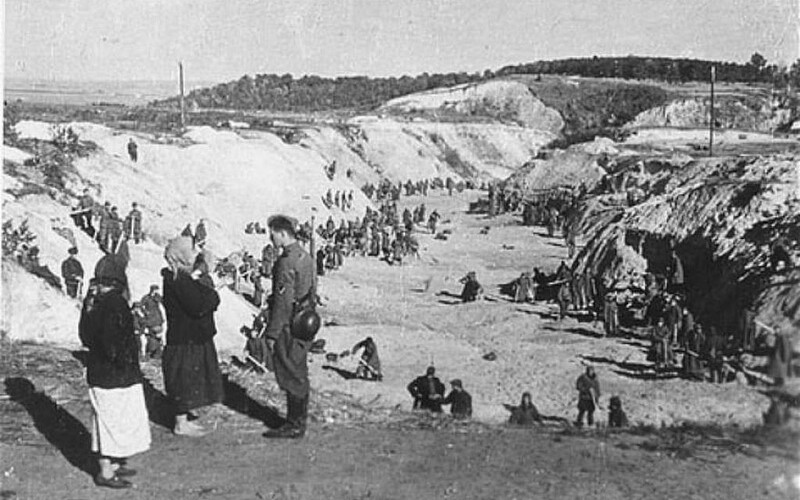 Even after the death of Stalin, Babi Yar remained lost in the "memory hole" of history. Such dread comes over me. With its open attack upon anti-Semitism and its implied denunciation of those who rejected Jewish martyrdom, the poem exerted a profound impact on Soviet youth as well as upon world public opinion. Dmitri Shostakovich set the lines to music in his 13th Symphony, performed for the first time in December 1962. Russian ultranationalism struck back almost immediately. Yevtushenko was sharply criticized by a number of literary apologists of the regime and then publicly denounced by Premier Nikita Khrushchev in Pravda on March 8, 1963. The theme of a specific Jewish martyrdom was condemned. But Babi Yar would not remain suppressed. It again surfaced during the summer of 1966 in a documentary novel written by Anatoly Kuznetsov published in Yunost (Eng. tr. 1967). Earlier that year the Ukrainian Architects Club in Kiev held a public exhibit of more than 200 projects and some 30 large-scale detailed plans for a memorial to Babi Yar. None of the inscriptions in the proposed plans mentioned Jewish martyrdom. Only after the collapse of the Soviet Union did the new Ukrainian government acknowledge the specific Jewish nature of the site and an appropriate rededication was held. By the 2000s, plans were underway for the creation of a Jewish Community Center and an appropriate Jewish memorial on the site. No stranger to controversy, the new use of the site has been challenged by some as being too close to the massacre site and being built therefore on sacred soil. Y. Yevtushenko, A Precocious Autobiography (London, 1963); W. Korey, in: New Republic (Jan. 8, 1962); idem, in: Saturday Review (Feb. 3, 1968); S.M. Schwarz, Yevrei v Sovetskom Soyuze 1939–1965 (1966), 359–71. ADD. BIBLIOGRAPHY: E. Klee, W. Dressen, and V. Riess, The Good Old Days: The Holocaust As Seen by Its Perpetrators and Bystanders (1988); I. Ehrenburg and V. Grossman, The Black Book (1981).